The East Coast Music Association (ECMA) is excited to announce James Mullinger as host for the 2017 East Coast Music Awards Show taking place on Thursday, April 27, 2017 at Harbour Station in Saint John, NB. James Mullinger is a renowned comedian who has sold out the Imperial Theatre twice, appeared on CBC many times, produced three seasons of his own television series which follows him around Canada performing comedy shows and headlined comedy clubs all over the country. Moving to Canada from the UK in 2014, Mullinger has not only been nominated for a Canadian Comedy Award for Best Live Solo Show as well as a Just For Laughs Award for Best Comedy Show, he has also become an avid supporter and vocal proponent of the city of Saint John. In April 2016, Mullinger performed a sold out show at Harbour Station, outselling icons such as Jerry Seinfeld, Iron Maiden, and Def Leppard. This year that celebration will be available to people all over the world thanks to a partnership with Bell Aliant, the official broadcast partner of the 2017 ECMAs. The 2017 East Coast Music Awards Show will be broadcast on Bell Aliant’s TV1 platform and to Bell Fibe TV subscribers, as well as streamed online, free of charge, at ecma.com. In addition, select showcases will also be available to stream live on ECMA TV (also at www.ecma.com) throughout the festival. Tickets for the 2017 East Coast Music Awards Show and more information about the evening’s lineup will be available on Monday, October 3. 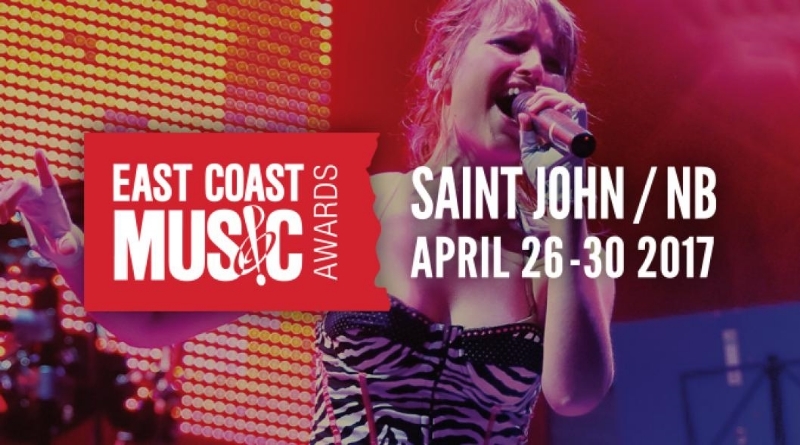 Returning to Saint John, NB for the first time in 15 years, the 2017 East Coast Music Awards: Festival & Conference (2017 ECMAs) takes place from April 26-30. An internationally recognized event, the ECMAs are a five-day, non-stop musical celebration showcasing over 500 East Coast artists. For the last 29 years, the event has continued to develop, advance, and celebrate East Coast music and industry professionals throughout the region and around the world. The ECMAs also feature a world class Industry Conference, as well as an Export Buyers Program that welcomes industry professionals from Canada, US, Australia, and Europe. The 2017 ECMAs will feature performances at venues throughout Saint John, including Callahan’s Pub, BMO Theatre, Le Faubourg, Sanctuary Theatre, Kent Theatre, Harbour Station, Saint John Trade and Convention Centre, and Saint John City Market. The host hotels for the event are Delta Brunswick and Hilton Saint John. Market Square serves as “The Home of the 2017 ECMAs,” hosting the ECMA Fan Fest presented by Irving Oil. Taking place on Saturday, April 29 from 12:00pm-3:00pm, the event features performances by East Coast musicians, meet-and-greets, autograph sessions, and more. The ECMA Fan Fest is a great opportunity for fans to get up close and personal with their favourite musicians. Stay tuned for more details about the event’s lineup. Market Square also serves as the home to Radio ECMA, which broadcasts live each day of the festival. A Classical Showcase at the Sanctuary Theatre also takes place on Saturday, April 29. Presented by ECMA, Canadian Music Centre, and Symphony New Brunswick, the showcase highlights some of the best classical talent in the Atlantic region, shining a particular spotlight on New Brunswick composers and musicians. Once again, the ECMA is proud to present the East Coast Music Aficionado Program, an initiative that supports the music industry and musicians of Atlantic Canada. This program welcomes patrons of the arts community to contribute to the ECMA to ensure the association can continue to foster, develop and grow the music industry in Atlantic Canada. East Coast Music Aficionados will each donate $10,000 to this initiative. If you are interested in becoming the next East Coast Music Aficionado, please contact Andree Gracie at sponsorshipmanager@ecma.com.